While a good portion of the country battles the cold weather that January brings, the racing world heats things up each year with the Chili Bowl Nationals. 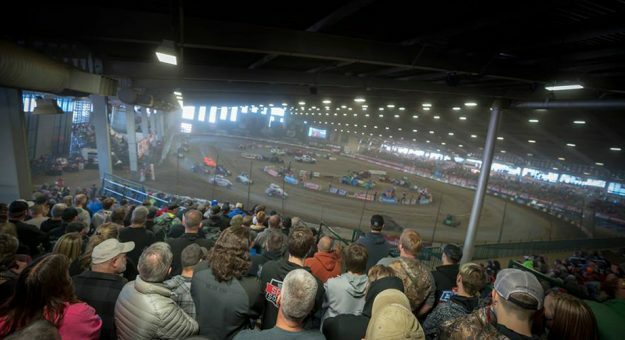 This week, some of the best drivers dirt racing has to offer have flocked to Tulsa, Oklahoma, for the 33rd running of the annual indoor midget car event held on a 1/5-mile dirt oval at the River Spirit Expo Center. As of Jan. 14, more than 350 drivers and teams were featured on the entry list as five qualifying nights lie ahead leading up to Saturday night’s A-Main event. The champion gets the coveted Golden Driller, a replica of the 76-foot statue located outside the venue. At the top of that elite list of powerhouse drivers are a few of NASCAR’s finest talents. NASCAR Xfinity Series driver Christopher Bell goes into this year’s Chili Bowl searching for his third consecutive victory. In 2017, the Norman, Okla., native became only the second Oklahoman to win the event, beating out World of Outlaws driver Daryn Pittman for his first triumph. In 2018, Bell took advantage of Monster Energy NASCAR Cup Series driver Kyle Larson’s misfortunate after engine issues parked Larson in the waning laps. Bell out-dueled two-time Chili Bowl champion and former Gander Outdoors Truck Series driver Rico Abreu for the victory. Bell, 24, will need to get past the usual suspects in order to become just the third driver to win three or more Chili Bowls behind four-time winner Kevin Swindell (2010-13) and five-time winner Sammy Swindell (1989, ’92, ’96, ’98, 2009). Bell feels his stiffest competition is none other than Larson as both will compete under the Keith Kunz Motorsports umbrella. Monday kicked off a week of action-packed racing, including practice rounds that began at 9 a.m. local time, followed by the first night of preliminary racing. The entry list is divided into sections for each qualifying night, which includes a series of heat races and qualifiers, followed by a 25-lap feature event. The top-two finishers in each qualifying night feature event lock themselves into the 24-car A-Feature event on Saturday night. Drivers who do not finish in the top-two positions in their respective preliminary features will have one more shot to make the field with a series of main events on Saturday, with the top-seven finishers from each of the two B-Mains transferring to make up the full field. Along with the list of NASCAR national series regulars includes Karsyn Elledge, the niece of NASCAR on NBC race analyst Dale Earnhardt Jr. and daughter of Earnhardt’s sister and co-owner of JR Motorsports, Kelley Earnhardt Miller. The 18-year-old rising dirt-racing driver is competing in her first Chili Bowl Nationals.